Linda Wu is a product manager at Amazon Web Services. Combine the speed and availability of a high-end commercial database with the simplicity and cost-effectiveness of open source. Deliver full compatibility with the popular open-source database MySQL so that customers don’t need to change their existing applications. Offer a managed service so that customers can focus on developing applications rather than worry about keeping their databases up, and only pay for what they use. Provide a cloud-native database that meets the scalability needs of modern applications. Today, thousands of customers and partners have adopted Amazon Aurora (MySQL Compatible). We see customers and ISV partners coming to Amazon Aurora from various sources. Some are moving from on-premises databases to Amazon Aurora; others are migrating from their MySQL or commercial databases on Amazon EC2 to Amazon Aurora. Alfresco Software, an enterprise open-source content and process services company, was one of the early adopters of Amazon Aurora. The company wanted to provide highly scalable content management services in the cloud. It turned to AWS services, including Amazon Aurora, to realize its goal. In a typical customer deployment, shown in the following diagram, Amazon Aurora provides a high-performance database to store metadata and metadata hierarchies for the content that’s managed on the Alfresco platform. The metadata helps people find the right content quickly and easily. It’s also used to move documents through a business process, control content access, and automate records management. 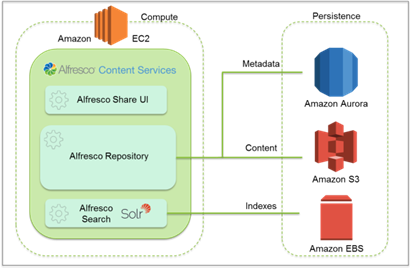 In a sense, Amazon Aurora powers “the brains” of Alfresco Content Services. Alfresco adopted Amazon Aurora because of its fast and linear scalability. In past benchmarking tests, Alfresco Content Services surpassed the 1 billion document mark with a throughput of 3 million documents per hour. This is 10 times faster than their previous MySQL environment. Alfresco also valued the high-availability architecture in Amazon Aurora, and the fact that it’s self-healing and fault-tolerant with instant crash recovery. Best of all, Alfresco didn’t need to make any code changes to the application stack that was built on MySQL. It just worked. We often see customers use AWS CloudFormation templates to automate and accelerate their deployment, including Amazon Aurora. 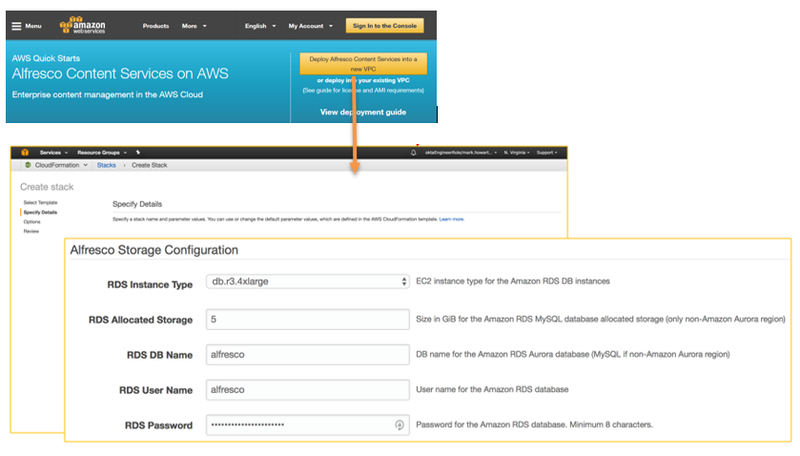 Alfresco recently released an AWS Quick Start to help customers quickly deploy Alfresco Content Services on AWS, using Amazon Aurora, Amazon EC2, and Amazon S3. It builds in best practices for availability, scalability, and security and reduces deployment time to less than one hour. This is a significant improvement in time-to-market compared to typical on-premises deployments that could take days or even weeks. The Quick Start automates the deployment of the architecture shown in the following diagram. 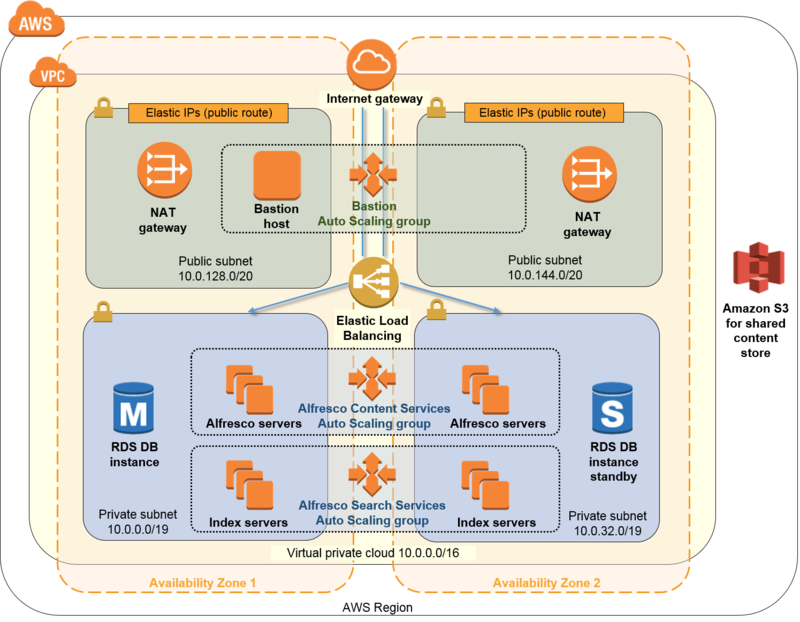 To deploy, from the Quick Start page, simply select whether you want to deploy Alfresco Content Services into a new or existing virtual private cloud (VPC). You can customize the parameters for the template, including the database and advanced options. Once you click Create, you’re on your way to your deployment. To learn more, visit AWS Quick Start for Alfresco Content Services.